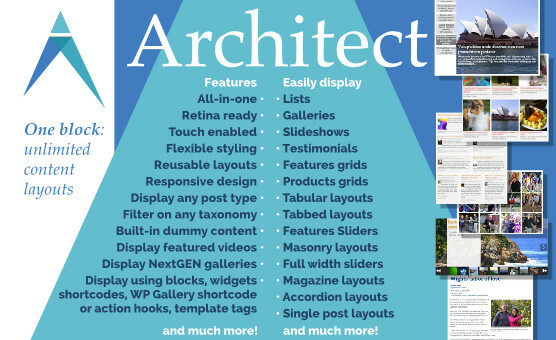 Architect is an all-in-one content block for Headway. All-in-one means you can design any layouts using the one block. For a little more than the cost of two blocks, you can get one that does what four or more other blocks would do. Note: This one is also using the Dummy content feature of Architect. This example demonstrates Architect displaying custom content by using Woo Commerce custom content type, as well as displaying a custom field (the price) and includes a shortcode in meta for the add to cart button. Architect requires the Redux Framework plugin to run. You will be prompted to install it if you dont’ already have it after installing Architect. Support for Architect is provided directly by submitting requests to [email protected] First response support is provided by the awesome folks at Influx, WordPress support specialists.